The Jolly Fox – Page 19 – Find Food & Frolic. Black Garlic Brownies w/ Vanilla Bean Cream Cheese Topping & Kabobs. Black garlic; a fine ingredient for brownies. No seriously. It’s made by fermenting regular garlic. It’s sweet and savory at the same time and totally delicious. 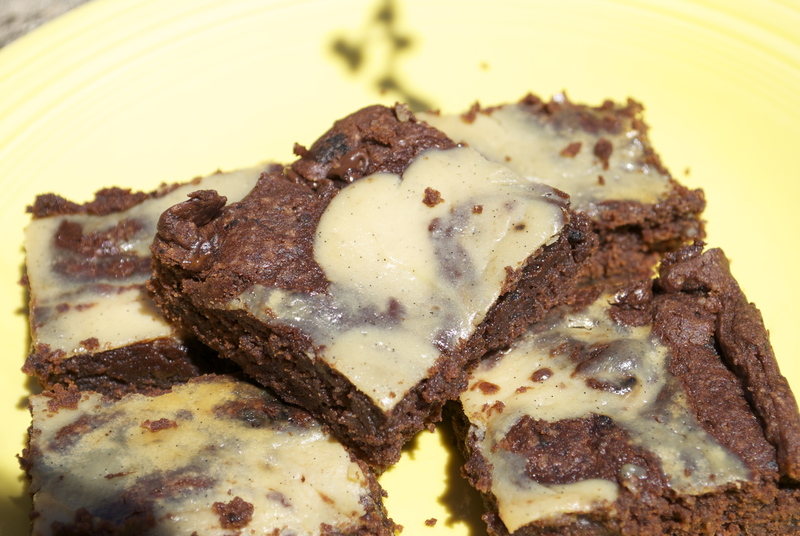 To make these brownies, add 1 head of smashed black garlic to your mix and bake as usual. Top them with this simple tofu-cream cheese based puree and it’s heaven in your mouth. I’d post my brownie recipe, but it’s really not that different the one in Vegan Cookies Invade Your Cookie Jar. I just use slightly different measurements and a brown rice flour/all purpose flour blend and no starch. 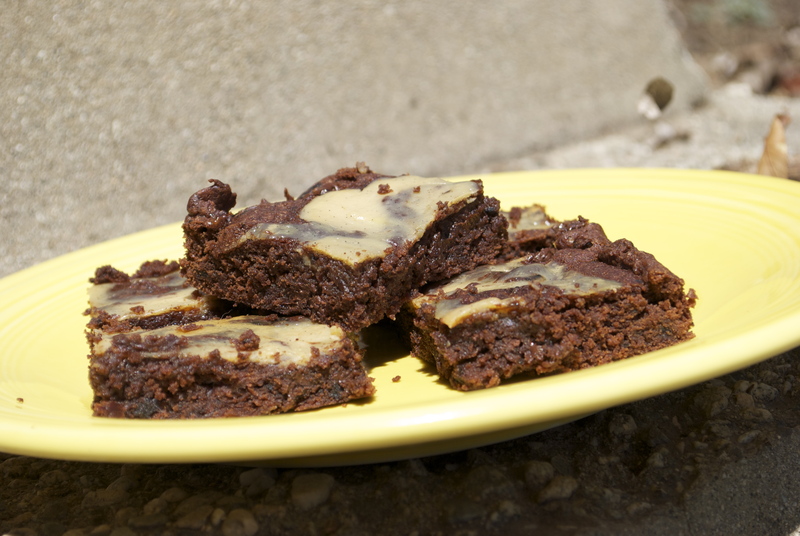 Well, so it’s a little different, but really, we don’t need another vegan brownie recipe. Just spice up your favorite recipe. Method: Combine all ingredients in food processor and blend until smooth. Dollop or swirl into brownie batter and bake as usual! 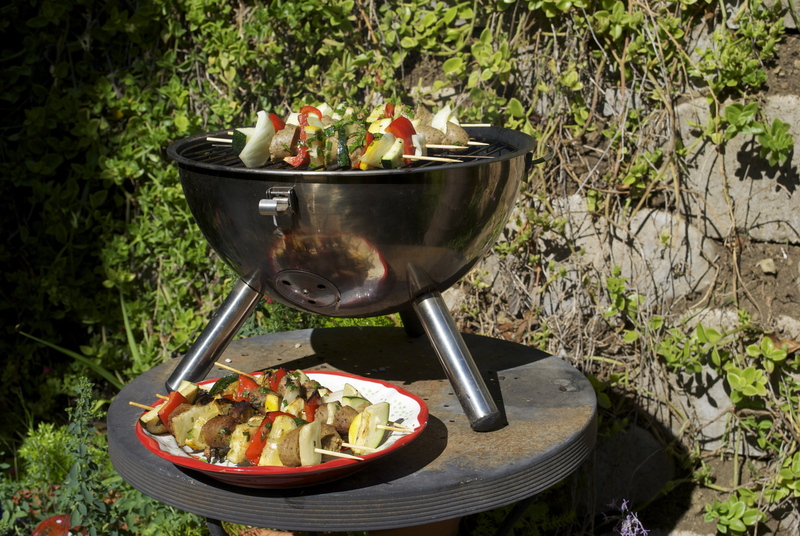 I also decided to start breaking in my tabletop grill for the summer. Most people have probably been grilling for over a month now, but I hadn’t felt inspired. I saw these kabobs on an episode of Giada at Home and I thought I’d give them a try. I followed the recipe except used Field Roast Apple Sage sausages. The Italian flavor would have worked too. 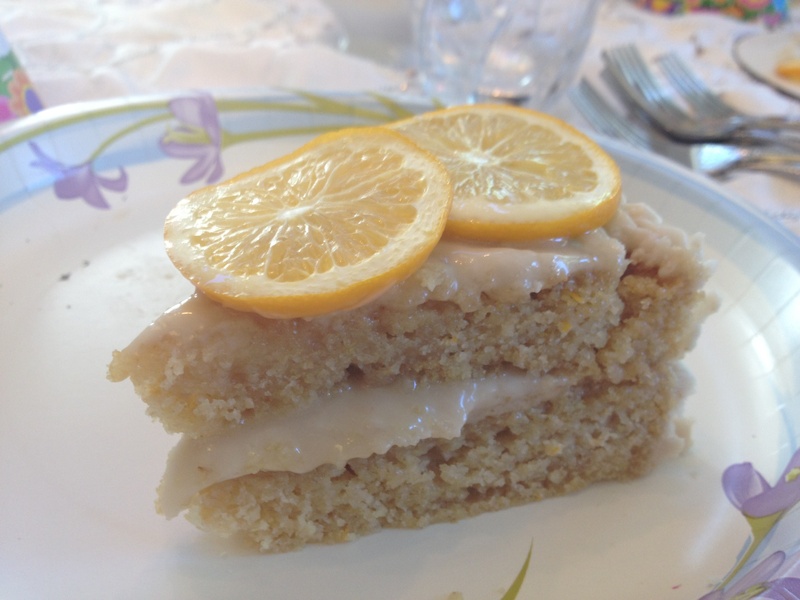 Anyhow, they are super simple to put together and the lemon reaaaallllyyy makes them. 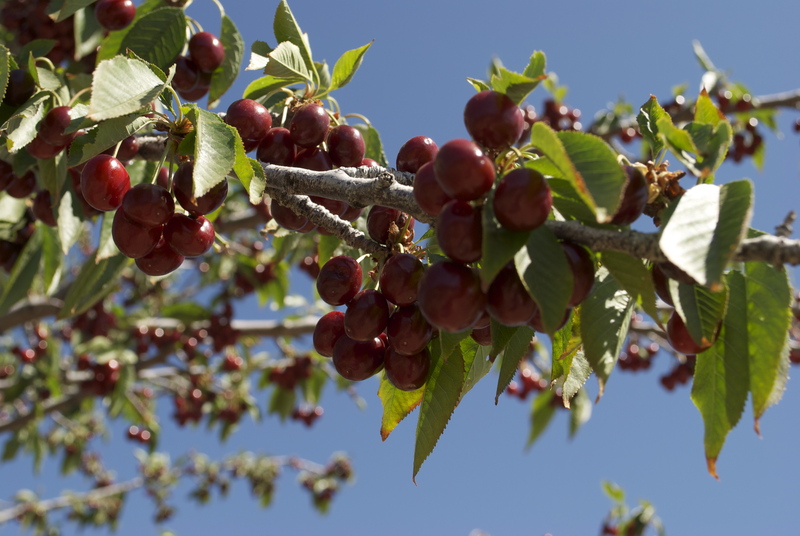 They’re just a little different than standard kabobs and they’re very tasty. 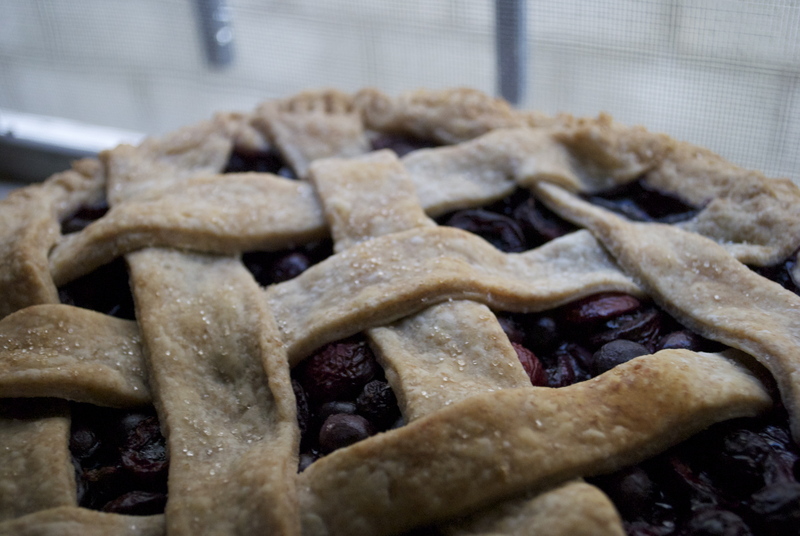 M&M Peach Ranch + Blueberry-Cherry Red Wine Pie. 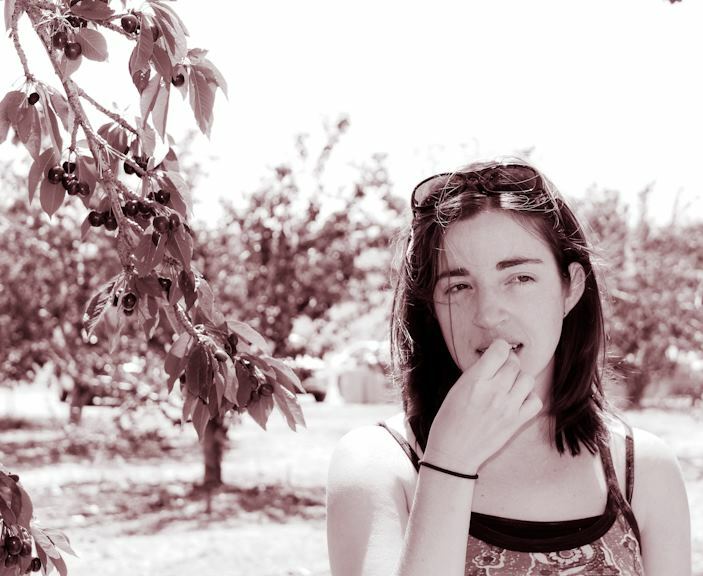 My friend Michelle enjoying a Bing. 🙂 Photo by Danielle of Look Pretty. Getting my Bing on. Photo by Danielle of Look Pretty. 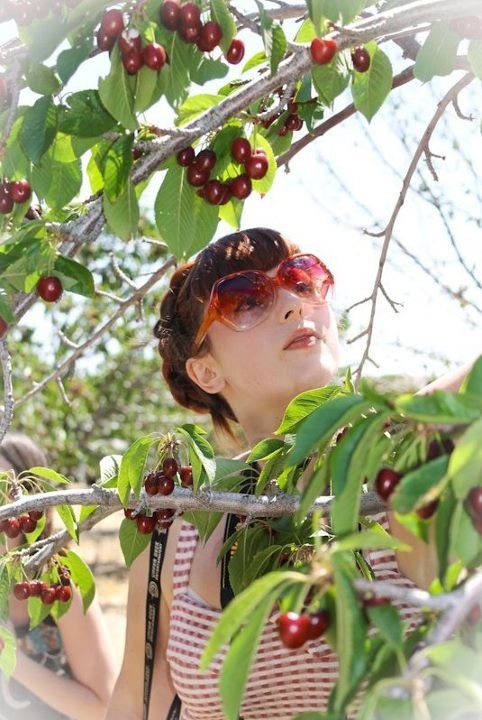 It was a great and beautiful cherry picking experience. 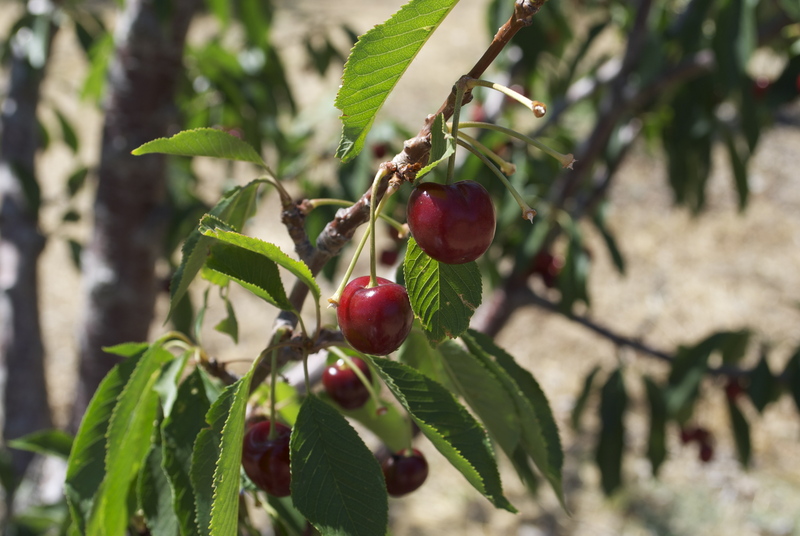 The cherries were ripe as could be, organic and $4 per lb which is pretty cheap for cherries in Southern California, even conventional cherries. 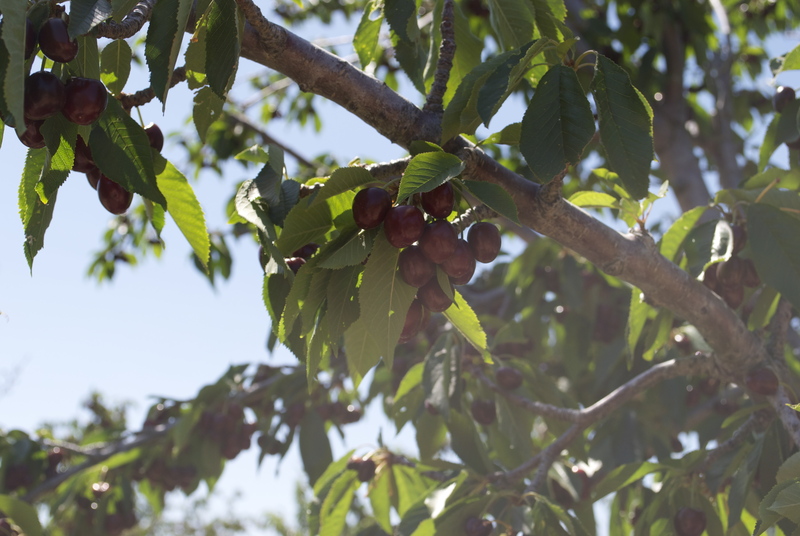 The farmers were extremely nice and so helpful. 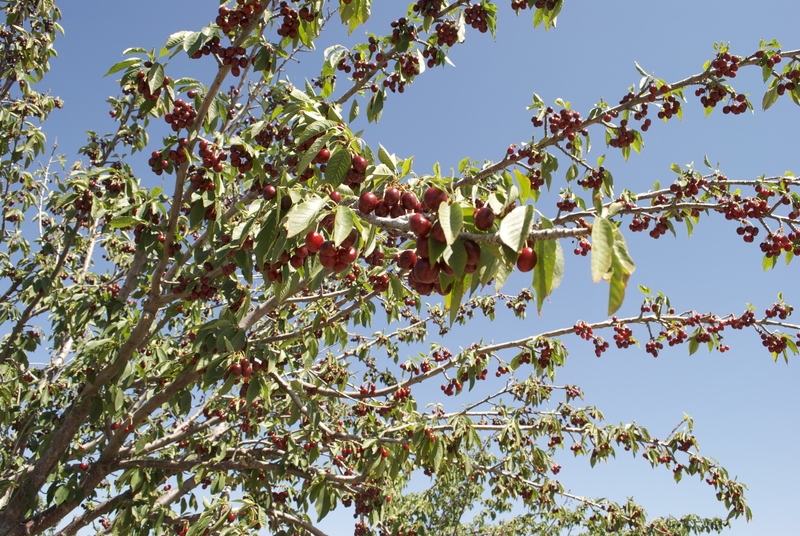 I am looking forward to going back for some yummy peaches. 2. 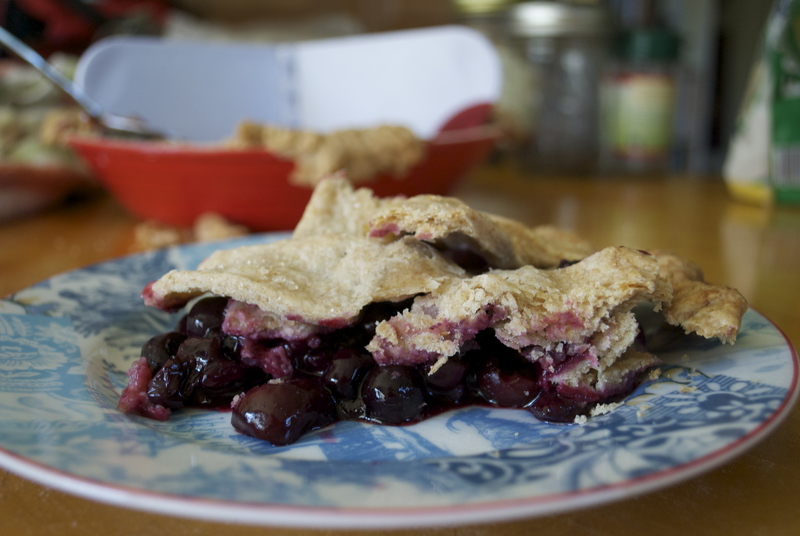 I made the Blueberry-Cherry Red Wine Pie from Eat the Love. (to make vegan, just sub out butter for Earth Balance, reduce salt in crust, and add a bit more liquid than called for–for the dough. Really easy! 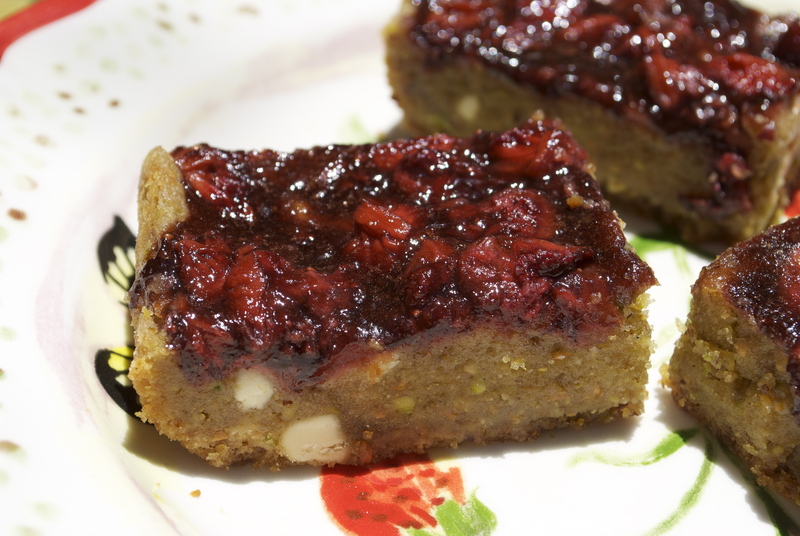 I used Green Bridge Organic Petite Sirah for the red, and as usual, subbed the cornstarch out for arrowroot. 3. I ATE SOOOO MANY. 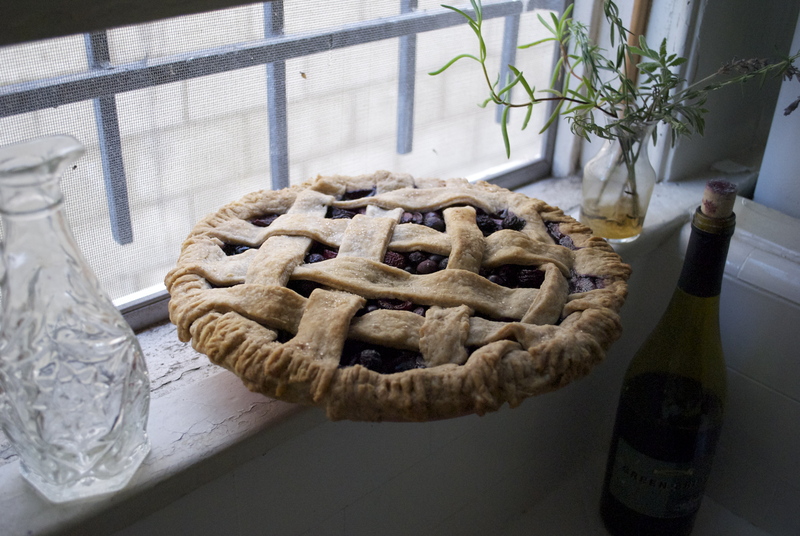 Pie cooling on a windowsill. It happens in real life! Nevermind my funky lattice. Not really sure what was going on in my mind while I was doing it. Looks a lil flat, but I assure it was filled with the most fantastic berry filling ever. This is not a new recipe. I have seen it floating around the interwebs for a while. It’s because it’s full of awesome. 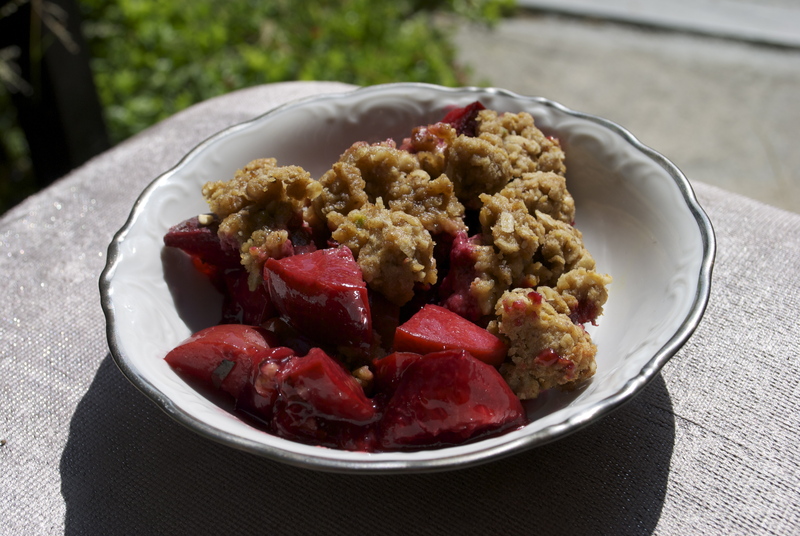 The original, from Smitten Kitchen is not vegan, but with some very simple edits can be made dairy free in a snap. This savory pie tastes like summer. 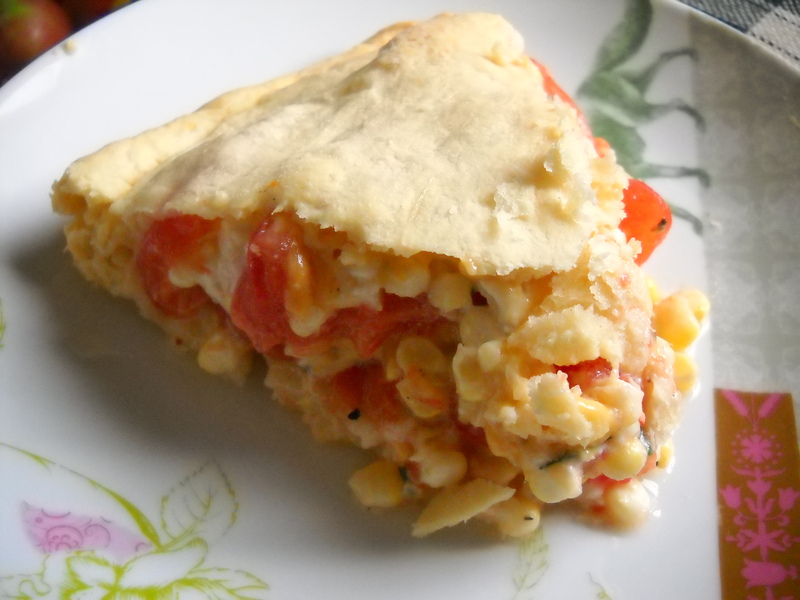 If you’re into summer and some of the wonders that summer brings (corn and tomatoes) then you will love this pie. 1 3/4 teaspoons salt, divided *reduce salt for the crust to 1/4 or 1/2 tsp. Since Earth Balance contains salt already, you don’t need as much. 7ounces coarsely grated sharp Cheddar Daiya Cheddar (1 3/4 cups), divided **you can buy the pre-packaged shreds, or you can buy a whole block and grate it yourself. I haven’t attempted to grate the new wedges yet, but I bet they will grate just fine if you get them cold enough. Whisk together flour, baking powder, and 1/4 to 1/2 tsp salt in a bowl, then blend in cold Earthy B. 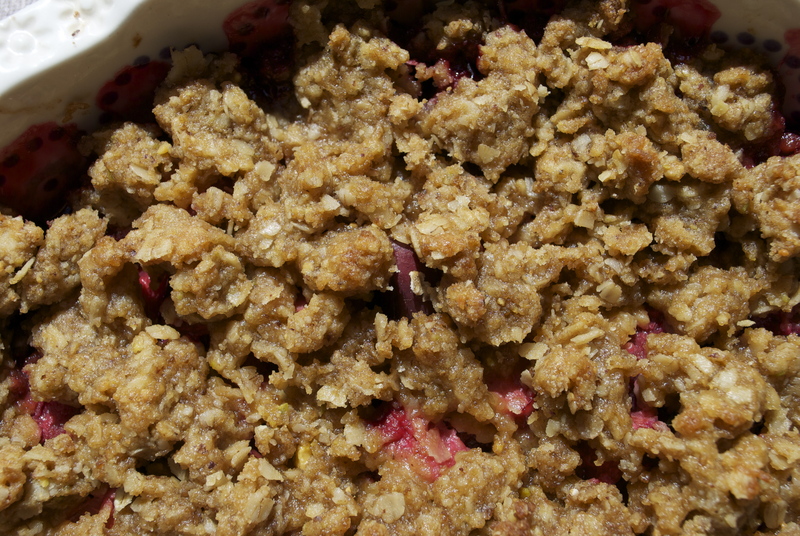 (3/4 stick) with your fingertips or a pastry blender until it resembles coarse meal. Add almond milk, stirring until mixture just forms a dough, then gather into a ball. Preheat oven to 400°F with rack in middle. If your kitchen is excessively warm, as ours is, go ahead and put the second half of the dough in the fridge until you’re ready to use it. Whisk together Vegenaise and lemon juice. Cut an X in bottom of each tomato and blanch in a large pot of boiling water 10 seconds. Immediately transfer with a slotted spoon to an ice bath to cool. Peel tomatoes, then slice crosswise 1/4 inch thick and, if desired (see Notes above recipe), gently remove seeds and extra juices. Arrange half of tomatoes in crust, overlapping, and sprinkle with half of corn, one tablespoon basil, 1/2 tablespoon chives, 1/2 teaspoon salt, 1/8 teaspoon pepper and one cup of grated Daiya cheese. Repeat layering with remaining tomatoes, corn, basil, chives, salt, and pepper. Pour lemon Vegenaise over filling and sprinkle with remaining cheese. Roll out remaining piece of dough into a 12-inch round in same manner, then fit over filling, folding overhang under edge of bottom crust and pinching edge to seal. Cut 4 steam vents in top crust and brush crust with melted Earth Balance (2 teaspoons). Bake pie until crust is golden and filling is bubbling, 30 to 35 minutes, then cool on a rack. Serve warm or at room temperature. 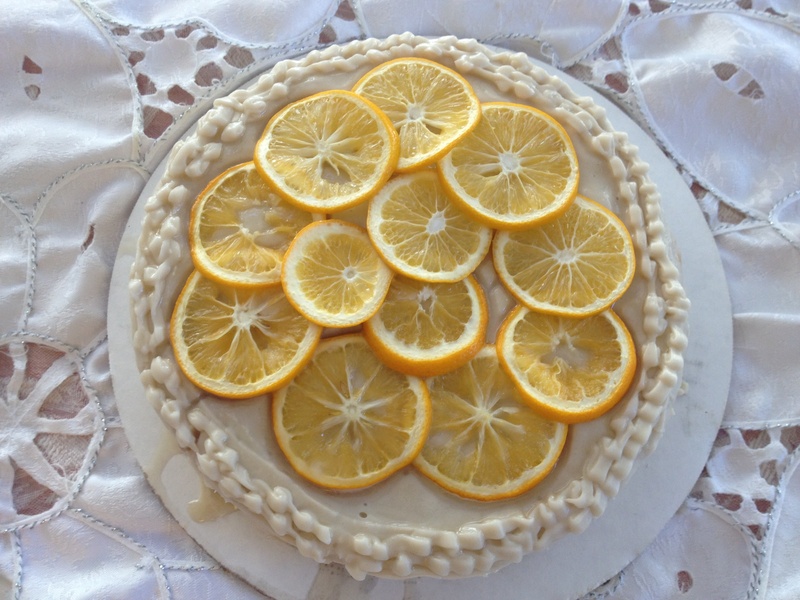 Meyer Lemon Cake for Mom. My mom requested lemon for her birthday cake flavor, so I made this cake. I miss living in Echo Park. I moved from there to an area in LA called Franklin Village. While it’s super cool that you can see the “wood” of the Hollywood sign from the backyard, I miss my old stomping grounds. Something about the eastside is just….I don’t know how to explain it….I just miss it. I still go over to my old neighborhood for work. 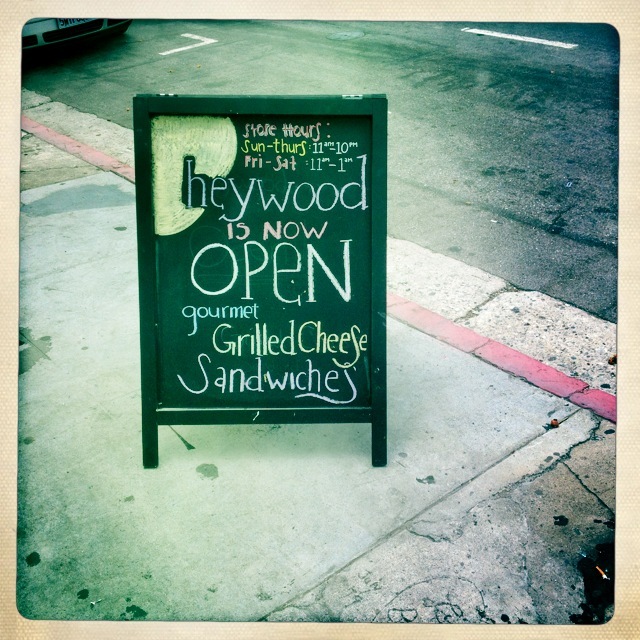 I have been passing by Heywood Grilled Cheese Shoppe in Silverlake for at least a few months now. I could see from their sign that they were a grilled cheese shop. I remember thinking to myself that they had a great concept with that. People love grilled cheese! It’s a classic comfort food combining everyone’s favorite things; bread, butter and cheese. And then my heart sinks a little because I don’t eat butter or cheese. Boo. But I booed too soon. It suddenly occurred to me while driving by that I live Los Angeles…where many places that offer meat and cheese will also cater to vegans. Low and behold I check their menu and YAY. They totally have Daiya and therefore have several different sandwich options for vegans. 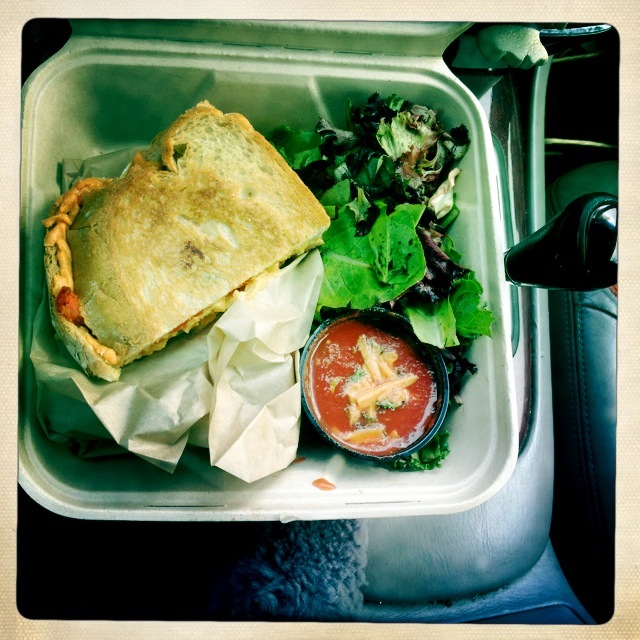 Excited and full of joy, I decided to place a lunch order to pick up while visiting Angelino Heights for work. I ordered the “Bill Clinton’s Epiphany” straight from the menu. 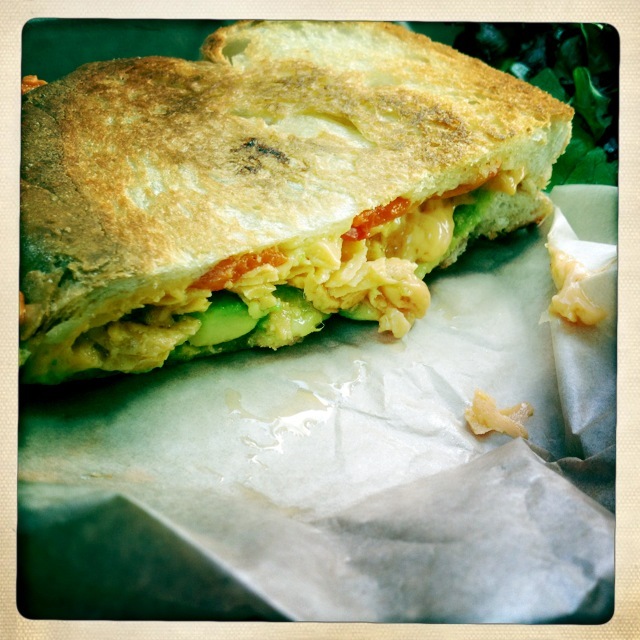 It has “vegan cheddar cheese, roasted red peppers and avocado melted into a country white bread”. While I don’t normally eat white bread, I splurged on it and couldn’t be happier that I did. Absolutely freaking deliciously nomtastic. Say that five times fast. The guy who was working was also very kind, friendly and accommodating. They made my grilled cheese as quickly as possible (Daiya takes a lil minute to get really melty). All of the yummy sammies come with a fresh side salad, and a tomato dipper–this is like a tiny cup of tomato soup to dip your sandwich into. Brilliant. They top it with cheese, but without even asking the guy made sure he topped mine with vegan cheese. I love him. I love Heywood. 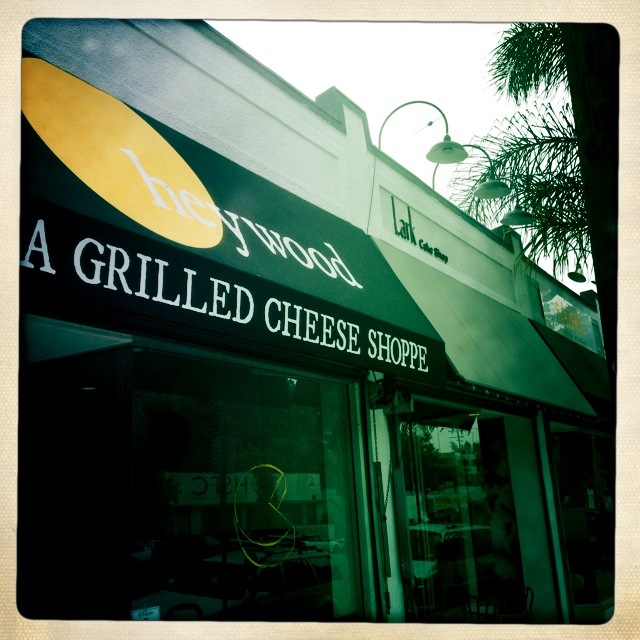 Go to there right now and order some of their fantastic grilled cheese! The best close-up I could get of the delicious.